First impressions are important. Not only do we prevent bad habits and promote excellent hygiene but we also understand that the dentist can sometimes be a scary place for children. This is why we strive for a positive, safe and friendly experience. Healthy kids are happy kids. Since January 2014 the Child Dental Benefits Schedule (CDBS) has provided basic dental and children’s dentist services—examinations, X-rays, extractions, fissure sealing and root canals—to 3.4 million children aged 2-17. The total benefit entitlement is capped at $1000 per child over a two-year period. The CDBS has a means test and the pre-requisite is either Family Tax Benefit Part A (FTB-A) or a relevant Australian Government payment. Please note that orthodontic and cosmetic dental work is not covered under this scheme. If your children are eligible for CDBS, confirmation via post, please ensure that you let our friendly receptionists know and remember to bring the letter and Medicare card to the dentist appointment. We are preferred providers for all major health funds including Medibank and Bupa. Your children may be eligible for up to two check-up and cleans annually by our children’s dentist, which may be completely or partially covered by insurance. Prevention generally trumps treatment because children who regularly visit the dentist for check-ups tend to have fewer dental problems. An infant’s first primary tooth usually erupts at about six months of age but this can occur as early as birth or as late as the child’s first birthday. Parents should start cleaning their child’s teeth immediately by brushing gently with a soft-bristled baby toothbrush and a pea-sized portion of toothpaste. Baby teeth should be brushed in the morning and just before bed time. 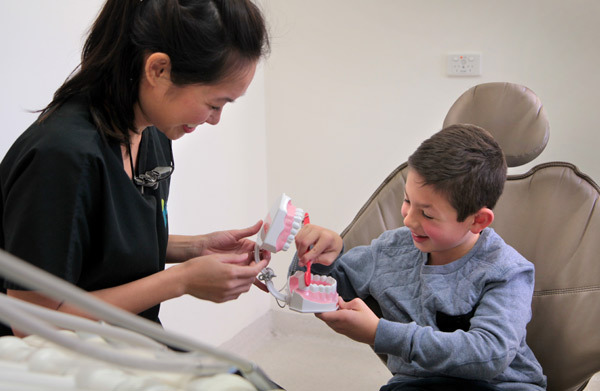 The Australian Dental Association recommend that a child should see a children’s dentist either within their first 12 months of age or shortly after the eruption of the first tooth. All twenty baby teeth will have usually broken through the gums by the age of three. Children start losing their teeth from the age of four onwards and our dentists encourage your child to gently wiggle ‘wobblers’. If your five-year-old complains of pain in the back of their mouth it may be due to 6-year molars coming through. Alternatively, it may also be a cavity so it is best to seek professional medical advice. The new teeth may look bigger, especially those first few, but that’s because they are! Adult teeth also tend to be less white than baby teeth and have pronounced ridges because they haven’t been used yet for biting and chewing. Sometimes, not often though, several new teeth can come in before the old ones are gone, creating two rows of pearly whites (‘ugly duckling’ stage). Brushing is now more important than ever. You’ll probably need to supervise the process until your child is at least seven. Always use a soft, age-appropriate, toothbrush. Colgate, Oral-B and Macleans offer toothpaste formulas with less fluoride that are recommended by dentists and suitable for children. Children under the age of ten are not as dextrous as adults and need help from parents and guardians with flossing to prevent cavities forming between teeth. If you have difficulty flossing your child’s teeth please let us know—our children’s dentist may be able to discuss other options. Children usually do not lose all their baby teeth until they are 11-14 years-old. We recommend regular check-ups at least every six months so that we can: check and clean, prevent disease and intervene early, if required, to ensure a smooth transition from baby dentition to permanent dentition. At Greenvale Dentistry we use digital dental X-rays to check for cavities in teeth before they are visible in the mouth. This is vital for children’s oral health because dentists can determine the presence or absence of adult teeth by approximating how long a baby tooth has until it is likely to exfoliate. It’s also a great opportunity to examine teeth alignment to assess whether orthodontic intervention is recommended. Maintaining excellent oral health during pregnancy might be the last thing on your mind as you deal with food cravings, morning sickness and other stressful obligations. It is important, however, to look after yourself and bub. Routine dental treatment is safe during pregnancy so please check in. Just let one of our friendly staff know when you’re booking an appointment or when you arrive at our surgery. Set a good example for your children, friends and colleagues by visiting a dentist on a regular basis. Practice good oral hygiene before and after your baby is born. A dental/fissure sealant is a preventative treatment that seals the deep grooves on the top of the back teeth to help protect them. A thin resin containing fluoride, to strengthen the tooth, is painted over the chewing surface of the tooth, which flows throughout the fine grooves making the tooth easier to clean and less likely to decay. Fissure sealants do not require drilling. The surface of the tooth is simply cleaned and then the grooves are covered by the protective sealant. The resin is set via a light–activation system. This means, as soon as there are done, your child can eat, drink or clean their teeth immediately. Why Would Your Child Need a Fissure Sealant? The biting surfaces of your back teeth contain a complex pattern of pits and fissures. Pits are deep indentations in your tooth and fissures are grooves or valleys. If the pattern is quite simple and shallow and you are able to keep it clean easily with your toothbrush then a sealant is not generally needed. If the fissures are deep and narrow they can provide a sheltered place for bacteria to grow. The bristles of your child’s toothbrush may not be able to reach the plaque and food debris can lodge in these areas. Over time this can lead to dental decay. When Should My Child Have Fissure Sealants? Dentists generally place fissure sealants in the mouths of children and teenagers. The best time to place the fissure sealant is when the adult tooth has just erupted or within two years because this is when the enamel is at its weakest (enamel is considered ‘immature’ because it has not been exposed to fluoride for a long period of time to strengthen). For the first permanent molar this would be around the age of six; the second permanent molar at 12-years-old. How Long Does Fissure Sealant Last? Sealant usually lasts for many years, but needs to be checked regularly to make sure that the seal is intact. If the sealant wears over time it can be replaced or supplemented to prevent decay. At Greenvale Dentistry we are pleased to offer professional custom mouthguards for adults and children. Mouthguards are an easy and comfortable way to protect your teeth and your children’s teeth and can help absorb and spread the impact of a blow to your face, which might otherwise result in an injury to your mouth or jaw. The process is as simple as a quick visit to take an impression of your teeth and you can even order matching team colours. Timeframe to receive custom mouthguards is usually within seven days. Custom-fitted mouthguards should be worn while playing and training for any sport where there is a possibility of contact. Some examples of these sports include hockey, netball, baseball, basketball and even skateboarding and skiing. Just like having the correct shoes and sporting equipment, all people playing these sports should wear a custom-fitted mouthguard. The Australian Dental Association recommends investing in a custom-fitted mouthguard made by a qualified dentist. Mouthguards should then be checked at your regular dental visit. Over-the-counter mouthguards are far less effective than custom-fitted solutions. Stock mouthguards are set by biting into the mould—The Australian Dental Association does not recommend over-the-counter mouthguards simply because they do not provide enough protection against injuries to your teeth, mouth or jaw. 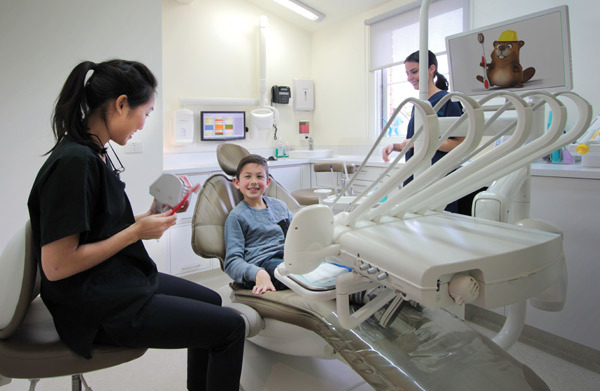 Speak to a children’s dentist today to discuss how to best manage your child’s oral health. From teaching good habits to addressing issues, early intervention is always best. Book an appointment today.